The Church in this graveyard was dedicated to St Damnon and was probably the first chapel in the Loughshinny /Rush area. The grave of John Connors (Jack the Bachelor) the smuggler, is at the back of the Church. Three priests from penal times are buried inside the chapel. 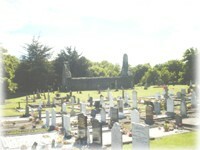 The tombs of the Baron of Strabane (1668) and Sir William Henry Palmer (1840) are also located there.